Tabitha’s training log for the first week with our two rescue mustangs. I’m an impatient person, and I always have been. This is one of the reasons that horses are so good for me, because in order to achieve anything sustainable with a horse, one has to have patience. Trailer loading is important to practice regularly if you have horses. Loading into a metal box that bangs and echos is a big deal for a flight animal. Yet, we need them to be able to do it. This skill isn’t just for horses that go to shows and competitions and clinics. Trailer loading is important for all horses in case we need to evacuate the property due to fire or flood. It has been on my mind since I started at Medicine Horse Program that I need to have trailer loading sessions with all our horses. A couple of months ago, we had some new program horses arrive at Medicine Horse Program. Spirit and Noble. Spirit, before coming to MHP, had some gnarly trailer experiences. In fact, he has a scar on his face that is due to an accident that he had in a trailer a couple of years ago. As a result of this experience, Spirit was nervous about any enclosed spaces, and even around things like walking through gateways. In the last month or so, I have been working on Spirit’s trust and confidence about going through gates, in and out of barns, walking over tarps, and other obstacles. He has done really well in a short space of time, and I think that he is going to make a wonderful therapy program horse for Medicine Horse Program. Today I decided I would trailer load Spirit. As we approached the trailer. Spirit gave me a flat “No!” The biggest “No!” he has given me over all the training challenges I have asked of him. Sure, the first time I ask him to do something new he would often give me an “Are you sure?” and would question, but this was a big old “Hell no!” He didn’t even want to go near the trailer. As soon as he saw it he ran backwards at full speed. I guess I knew then, that this wasn’t going to be a five minute training session. I’ve been here many times before with horses. When fear can lead them to do just about anything to get away from what you are asking of them. Yet, no matter how many times I work through something like this with a horse, I always learn something about myself. I learn about what my thoughts do when I am challenge, how my brain often wants me to run away too, and that just because I have thoughts of giving up, doesn’t mean I will. Getting Spirit onto the trailer the first time took some time. Some parts were dramatic, especially at the start, when he tried to intimidate me into giving up. Some parts were tedious, especially towards the end, where he was almost committing to me, then changing his mind due to his fear. And for me, my challenge was patience and consistency to hold the space and keep asking for his trust as he cycled through all these stages. When I watch my thoughts in times like this, I can see my own cycle of emotions. I can watch my patience being tested. Thoughts such as: Why did I pick today to do this? This is taking longer than I thought it would. I’m hungry. It’s lunchtime. I want to go home. I should give up, this isn’t going to happen. I have too much else to do today to spend any more time here with this horse. It is as if my brain can be having a tantrum all of its own. But I’ve been here so many times before that I know just to let those thoughts pass. Those are just my impatient-brain thoughts. I am used to those. They don’t mean anything. Stay present. Stay calm. Breathe. Stay here, with this horse, right now, and keep asking. And then, over forty-five minutes into the process I relaxed into and accepted the idea, that it was okay if we stayed here all day. That other things would have to wait. That I was committed. And it was okay to be here a while. Five minutes later, Spirit was on the trailer. This word has taught me so much it is hard to put into words. It has been a journey of an unusual kind. It impresses upon me the value of focus. The mere act of looking at this word and thinking of it in every situation was like surfing. I paddled out over the swells and searched for the perfect wave. When I chose the one I wanted I turned my board around, stood up, steadied myself and rode the experience all the way to the shore! Compassion transformed many times on this ride. It went from begrudgingly cutting someone slack whether I felt they deserved it or not, to feeling relieved that no longer felt the burden of having to judge someone for the act of stupidity I put on them, to understanding that feeling compassion really is a measure of the beholders self-esteem and security (at least mine) and now I have had the ultimate experience of truly understanding the word compassion to mean COME to the situation with PASSION. My most recent experience and two profound teachers were a horse and a boy. The horse was labeled as “a princess” who was “impatient” and didn’t like certain things like being groomed. The boy was a beautiful child who was also labeled as “ADHD” and “ high functioning Autistic.” It was said he could not focus and was scattered. I had the privilege of having them in a coaching session together. Long story short, after several trips through an obstacle course with horse on a lead and the boy leading, I asked if he wanted to brush the horse. Keeping my fingers crossed that she wouldn’t start her usual impatient dance of to and fro I watched as they engaged in what came to be an extraordinary connection of depth and respect. Not one hair was missed from head to toe, each being patiently put back into its place. Such focus, such intention, it was moving. The horse, too, seemed in a trance, moving not a muscle, not a whisker, only blinking an eye when the boy moved to another part of her body. She stood like a beautiful Greek statue. I began to feel like I was eavesdropping on some intimate experience. I felt out of place so I said nothing and just held the space. Toward the end of the grooming session I asked the boy if he thought he could get the horse (who was not on a lead) to walk through two upright panels near where he had been grooming. There were several hula hoops on the ground between them so I thought it might be a tall task but I went with my gut. “Sure,” he said and he stood up and walked through the portals himself and turned back to the horse and said, “Come.” The horse had watched intently as he walked away from her and took with him his loving touch. She then did something quite remarkable. She walked over the logs and hula hoops on the ground and straight to the boy and his brush. A boy who couldn’t focus and a horse who couldn’t stand still…or so they said. These kinds of experiences are why I love working with children and partnering with horses. When both are in the moment and truly connected magic is the result. This boy demonstrated to me that when you COME to the situation or being with PASSION the connection is so strong that there is no room for judgment or doubt or criticism. There is just a sense of BEING. And when you just BE you have no need or desire to judge or criticize. Then the true COMPASSION will arise. When you can passionately be in another’s presence and simply allow them to also BE...to connect and make contact with another in any given situation… that is true compassion. Compassion is the ultimate understanding of what is going on in the moment and, in this case a strong desire to be there in that moment with another. For more info about Lauren Munger and her programs please visit her website. By Kathy King Johnson, M.Ed. Now it's all up to you, you tiny, precious newborn thing. I walk in the barn and there you are, a perfect bundle in the middle of a bed of straw, your ears up, head up, looking at me. A joyous package, clean and silky, like the stork dropped you in the middle of the night. Mama Red has been busy. Sneaky mare, like most. You are cleaned, fed, and practically diapered. You have the most beautiful head I've seen on a TB, dished face, small ears and bright, intelligent eyes. Curly little devil horns swivel at every sound. But your eyes, your eyes are beautiful , eager but opaque, assessing, taking it all in. They are both blank slate and all knowing. When I say "hi," you whinny back. Do you remember my voice from the hours spent talking when I groomed Red? I pet you, all over. You like it. When you start to move, I back away, giving you room. You are restless, spunky, ready to go. Legs akimbo, knobby knees, you wobble up to follow me. Red trusts me with you. She is happy to see me too, because she is really, really hungry. She had a long night. Over the next 24 hours, you develop an attitude. You kick your mother. You buck and run and rear. You are athletic and impertinent. And quite cute. And in the following 24 hours, you have developed some manners. Your mother will only tolerate so much saucy behavior. She's young but she's not going to take your sass. I love watching you and your mother. It is down time for me, just to observe and reflect. I've been busy, mule show, trips to CSU for horse surgery, new babies, new horses on top of programs and executive directing. Busy is good. It takes my mind from the pain. I pace from the pain by moving from project to project, task to task, staying busy from morning til night. I am walking, talking, thinking, writing, listening, communicating all the time. Around you, I don't have to think about words for awhile. I don't have to think about them swirling, reversing, adding, deleting, disappearing or perseverating. I don't have to think about nuance, context , or sarcasm. I don't even have to speak. I can listen and I can watch. Sounds in nature aren't directed but somehow they're orchestrated. The snow bombs plop like fat white pillows. The starlings flit and chitter in the trees, sending motes of snow into the air. And the horses chewing their hay. Chewing, chomping, swishing, stomping. Sometimes barely moving. Deep snow, wet snow changes the sounds, like we are underwater. Time is slow. But you, little one, learn like lightning. I can see you grow in front of me. You are tormenting your mother. You tickle her leg and she moves it. You tickle it again and she moves again. It is a dance. And then she gets sick of it and bares her teeth and makes her best mare face. But she doesn't touch you. She knows where you are. And somehow, despite being 2 days old, you know where she is. You move out of her way when she asks. You follow her because she's the most interesting thing in your environment. You've inspected every inch of it. Not too many people have met a foal as young as you before. The children delight when you walk to them, fearless. Adults laugh and smile at your antics. We sit mesmerized, hours on end. Your birth and your newness make us alive. You fill our souls with joy and laughter, help us smile and make us love. You are fresh, vital springtime, bouncing, floating, rearing, racing fast as the sun across the sky. Medicine Horse Program rescued a little bay Andalusian filly at an auction for $150. When she arrived, she was exhausted, malnourished and could barely walk due to locking stifles. The veterinarian said she was probably pregnant. The filly had only been haltered once, did not know how to lead and had never been groomed. Women suffering from addictions, as part of the Rose House residential treatment center, met her on her first day at Medicine Horse Program. One look into her soulful brown eyes, one touch of her soft muzzle and they sensed the kindness and heart underneath her woebegone hide. How much they empathized with this little animal who has been kicked around, used and abused in her short lifetime. And so they named her Esperanza, for her Spanish heritage, and for the hope she brings. Within a week, the women were leading, grooming, hugging and loving her. Esperanza was the first of our 2016 HopeFoals, a symbol of resiliency, courage and a new life for all of those who come to Medicine Horse Program suffering and in need. As a new year breaks, we thank you for the generous donations that make our programs possible. So many new programs including Fearless Victory with the Boulder Veterans Center, Shiloh House for youths impacted by abuse, neglect and trauma, and an exciting collaboration with the State of Colorado's Department of Youth Corrections. Please continue to help Medicine Horse Program any way you can, cash donations, donations of hay, feed, equipment and services and by volunteering your valuable time. Thank you for supporting this sanctuary of peace and hope. A young girl came to one of our programs, in trouble for running away. She put her head down on the picnic table, closed her eyes and put her fingers in her ears. She shut herself off from everything and everyone. But the HopeFoals approached, always curious, eyeing her through the fence. I began to talk about the foals, how they were young and wild, how they used to run away and do silly things because they didn't know better. Slowly, the girl responded. She took her fingers out of her ears to listen. She peeked through her arms to look at the foals. And finally, she lifted her head and said, "Can I touch one?" It is a magic touch, this reawakening of the senses, this return to nature, this unbreakable bond between horses and people. We reach out to you again to help the at-risk clients and horses of Medicine Horse Program. Due to the heat and fires, we face drought and another hay shortage. Hay has become a living breathing monster here; we have nightmares about it. We have cut back our herd drastically, unable to rescue more horses until we can find homes for the mustangs we have been training for a year. Even with less help and fewer horses, we are running new collaborations with the YMCA, with Boulder County Expand, and Juvenile Diversion. We continue with our core programs, Veterans Peace of Mind, Imagine, Healing with Horses, Just Say Whoa and the HopeFoal Project. We are working harder to bring in more paying programs such as our MHP certification program. These paying programs support the at-risk clients who cannot pay. As the economy rebounds, we are only receiving smaller grants given in the depths of the recession. Corporate sponsors who dropped off have not returned. We are relying very much on the kindness of the Oak Foundation, Sky Ranch and donors like you. Please help by giving as much as you can. Every penny counts. He never spoke more than a few dozen words, each painstakingly taught by his mother. It took years, thousands of dollars and dozens of doctors before someone put a name to what was wrong with Geri Chestor's little boy. All four horses were rescued from Canyon City, which serves as a "holding pen" for wild mustangs rounded up across the West (these four came from Wyoming). They were adopted by Medicine Horse Program, a non-profit mental health organization specializing in equine-assisted therapy in Boulder. The program serves more than 500 clients a year. The Fearless Victory Project, part of the Medicine Horse Program, focuses specifically on veterans suffering from PTSD. By Kathryn King Johnson, M.Ed. Medicine Horse Program and Veterans Peace of Mind Project, both based in Boulder, Colorado, announce an exciting new collaboration, called "Fearless Victory." Veterans Peace of Mind Project helps soldiers with Post-Traumatic Stress Disorder (PTSD), providing mindfulness meditation programs as a psychological tool for dealing with trauma. 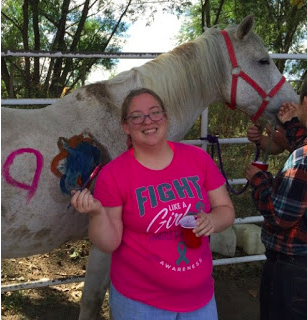 Medicine Horse Program also uses mindfulness based techniques in equine-assisted psychotherapy. Using horses as co-facilitators, therapists help soldiers connect in relationship with each other and the horses. 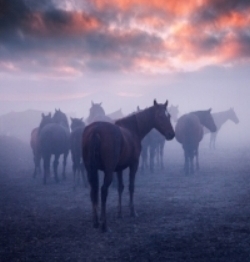 "The wild horses help me to open up. The more I open up, the more they connect with me. It spirals outward, and I start opening up more with people in my day to day life," said John, a Viet Nam vet. Most of the mustangs at Medicine Horse, caught recently on the range, are hypervigilent, with a strong flight instinct, and an aversion to being touched. "The symptoms are the same as PTSD," one veteran said, "When I got home from the war, I didn't want anyone to touch me. " As the horses learn to trust humans, the veterans see real results. In the process, they learn to trust the horses and begin to heal as well. An astonished veteran exclaimed at the progress of a mustang named Mama, "She is not the same horse we worked with a month ago. If Mama can heal so quickly, so can we. She gives us hope." Chandler is a buckskin colt, part Welsh pony and part something else. He arrived at Medicine Horse in mid December, walking on his hind legs. “A bi-ped!” I thought. The driver who shipped Chandler to Medicine Horse said that they were not able to touch him to load him for his journey. Instead, they formed a chute and ran him into the trailer. That is exactly how we unloaded him as well, forming a chute and letting him run to his stall. Only he did most of it rearing and bucking. Someone had somehow put a halter on his head, many months ago. It was already too small, and growing into his nose. The problem was we couldn’t catch him to get it off. In fact, we couldn’t touch him at all. We spent about a month at his stall during feeding time. He finally let us touch his head. But, he was very suspicious and would often bolt away. He is outstandingly athletic, and shows piaffe, passage, Spanish walk, and all the airs above the ground. I am almost certain he is half Andalusian. Medicine Horse staff was extremely patient with Chandler, and took at whole different tack with him than the other foals. He had to *want* to come to us. There would be no sneaking a leadrope around his neck, no hanging on to him him if left the scene, and no cowboys to rope him as was sometimes suggested. Staff spent extra time with him at feeding, just sitting in his stall with him, and then starting to scratch his neck. Day by day, the white around his eye began to fade. He started coming up at feeding time rather than running to the back of his stall. He let me rub his face and around his ears. I had to stay low, sitting on the feed trough. If I stood up and made a move for his halter, he would bolt to the back of his run. Eventually I was able to slip his old halter off his head. This was a mistake in afterthought, as we had not yet stumbled upon the Double Halter Method. Now, how do I get a new safety halter on? Creativity was key. I learned that if I kept the feed bucket in my lap and stayed low, sitting down, then Chandler was much less fearful. Eventually I held the halter in the feed buck and Chandler learned to put his head in the halter. But, I couldn’t get the strap over his ears to buckle it, or the feed bucket would fall off my lap, startling him and making me start the whole process all over. Because the foals are often far too shy to have more than one person in their stall, we start with one and gradually get them used to more. Working alone, we often feel like we don't have enough hands . I finally rigged a binder twine to the earpiece of the halter, and snapped the feed bucket to my coat! Then I had an extra hand. We call this "the Third Hand" Method. Within 5 minutes I had the halter on. Within 15 minutes, Chandler had it off. I was able to repeat the process the next day. Not long after that, something changed in Chandler’s eye. He got a sweet, soft, doe-like look in his eye. He came to the fence to watch me if I started working with another foal. He started coming right up to me, and let me snap a lead rope to him. I have been able to scratch his neck, to stand beside him and to touch his back. I can lead him short distances, but we have a long way to go. Chandler has already started work in the Hope Foal class. Because of his beauty and intelligence, the girls are drawn to him. Because of his innate shyness and lack of trust in humans, he will teach us all a great lesson in trust, patience, and creative colt handling.